Click here for fabulous deals! We just couldn't let this one go unnoticed. We've all had our mailboxes filled with countless emails promising cheap generic prescription drugs and a share in the personal fortune of an exiled Nigerian prince. Of course, if it's not a scam, it's usually a front for an organized crime ring. The US District Court finally decided that judicial action would be a better spam blocker than a simple email filter, and threw the book at the infamous spammer kingpin Christopher Smith, sentencing him to 30 years in prison for conspiracy, illegal distribution of drugs, money laundering, and operating a criminal enterprise. Of course, a steep sentence like that isn't without precedent. Smith's earned his reputation after fleeing abroad in order to evade trial here in the US. Smith's businesses, Minneapolis-based Burnsville Internet and Xpress Pharmacy Direct, were notorious for authoring more than a billion (!) spam emails purveying knock-off prescription drugs, most famously "v1agra." Smith fled to the Dominican Republic in May 2005 to continue his business after being shut down by the FBI. He was caught two months later upon returning to Minneapolis. 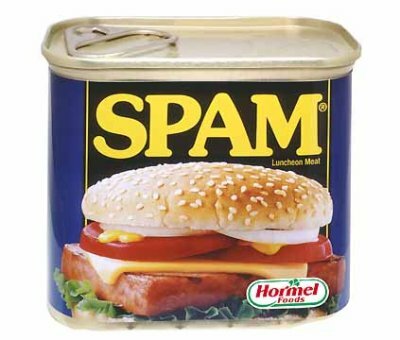 Finally, Spam can be restored to its rightful place: Monty Python sketches. Demico Boothe: Why Are So Many Black Men in Prison?